Three weeks ago over 200 girls were abducted at school in Chibok by Boko Haram, a militant extremist group whose name means “Western education is a sin”. There are reports of some of the girls having died, others being ill, some trafficked to Chad or Cameroon. The latest report is that 276 are still missing. The 15-18 year old girls have suffered and could suffer unspeakable exploitation. Confirmed abduction, physical violence, lack of care, slavery. Possible sexual violence, forced marriage, trafficking. This story highlights so much that is yet to be done, and it is easy to feel overwhelmed. Focused efforts are what is needed right now; but in the long run we must carry on working towards gender equality, freedom, access to education, safety, cross-border communication, strong legislation and enforcement. The WEF, World Economic Forum, takes places this week in Nigeria. This will bring together world leaders like Kofi Annan, David Cameron, Ban-ki Moon and others. Women and girls are a vital part of a healthy economy, and this is a great opportunity for leaders from elsewhere to put pressure on the Nigerian Government to act – it has been slow and has not made enough effort to bring freedom to the girls as of yet. Contact WEF attendees this week: tweet or write to them and their teams, asking them to do what they can to ensure the Nigerian Government #BringsBackOurGirls. Here is a list of participants: http://forumblog.org/2014/05/forum-africa-2014-nigeria-participants/. This is not just a news item or a tragic story. The girls who are missing have faces, families, dreams…and names. 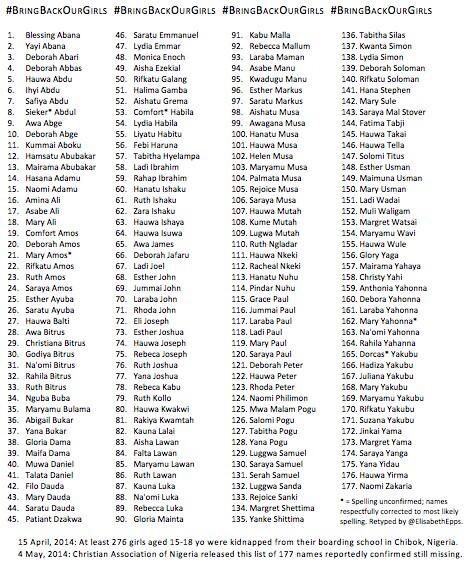 A list of some of the girls’ names was published last night – there is such power in this. They are real people. You have a name, she has a name. We are the same. Help her, please.